Sarah and I have been members of Sam’s Club since we were in college. It’s the only warehouse club within fifty miles of us. Over the course of a few weeks, we’ll build up a list of items that we need to buy in bulk. Toilet paper. Whole grain bread. Paper towels. Snack bars for our children’s backpacks. Pens. Printer paper. There are all kinds of little items around our home that we pick up in bulk from time to time. When we have several items on the list, one of us heads to the local warehouse store and picks up those items. In virtually every case, we save money per unit on those things we buy in bulk. Sometimes, we save significant amounts per unit. When you’re buying in bulk, savings “per unit” adds up to a lot of money. Let’s take toilet paper, for instance. At our local grocery store, the largest pack of the type of toilet paper we prefer is a nine roll pack which has a cost per roll of about $1.15. At our warehouse club, we can buy the same exact type of toilet paper in a pack of 45 rolls with a cost per roll of about $0.63. In other words, by buying that single jumbo pack at the warehouse club instead of buying five packs at the local grocery store, we literally save $23.40. We save on other bulk purchases, too, but this was the most dramatic of the items that I hand-checked in preparing for this post (most other items offered savings in the range of $2 to $10 for the bulk buy). In other words, on a typical warehouse club shopping trip, we save $40 to $50 over buying the items at a local grocery store. A single visit pays for our annual membership. Don’t buy anything that isn’t on your list. 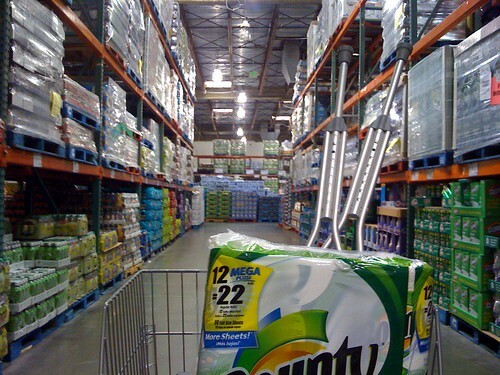 It’s easy to trick yourself into a sense that everything is inexpensive at a warehouse club. That’s not always the case. Shop carefully and stick to the things on your list. Do price comparisons. If you’re thinking of buying something in bulk, write down the cost of the item at your warehouse club and the number of items in that bulk pack. Then, go do your local grocery store and do the same. Divide the cost of the package by the number of items inside in each case to get the cost per item. If it’s cheaper at the warehouse club – and it usually is for us – buy it there. Share a membership. There’s nothing wrong with sharing a membership with a friend. Split the annual cost and you’ll both get use out of it. You can also split the larger bulk items that you buy, enabling you each to take home lots of inexpensive toilet paper, soap, and other items. Don’t buy perishables in bulk unless you’re sure you’ll use them. If an item has an expiration date, don’t buy it in bulk unless you are sure beyond any doubt that you will use all of it before it expires. Nothing wastes money faster than buying something, only to have to throw it out. Our warehouse shopping saves us hundreds per year without any exaggeration. Look into it – you might save quite a lot yourself.